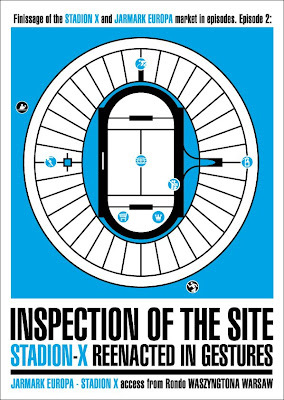 Inspections of the site are usually held in the place where something important has happened, and afterwards eyewitnesses try to report this situation. The second episode of Finissage of the Stadium X was formed on the basis of the inspection of the site and on the idea of meeting people who have been connected to the Stadium: Stanisław Królak (remarkable cyclist of the Peace Race), Janusz Zaorski (film director and a sport fan), traders from the Jarmark Europa Market, Euro 2012 planners and Adam Roman (sculptor), to name a few. and a presentation of “Boniek!” - a movie by Marcin Latałło. Stadium X, located in the center of Warsaw is a contemporary ruin. Build from the debris of the II WW was the flagship of the Stalin era. In the early 1980s, it lost its function as a sports facility to be “resuscitated” by Vietnamese and Russian traders – the pioneers of capitalism who created the biggest market in central Europe called Jarmark Europa. The area is the only “out of logic” place in the capital: overgrown with wild plants, shops open from 3 am to 12 pm, the crowd communicates in Asiatic languages while archeologists search for medieval treasures, making the place a Warsaw ‘Berlin wall’. The Stadium and the market will be replaced by a new National Stadium by the end of 2008. This (absent) presence of the ruin in the centre of a postcommunist city, the ongoing debate on Poland’s hosting of Euro 2012, lack of debate on the architectural heritage of the postwar era, the invisibility of the Vietnamese minority and a different logic of this place brought about a series of performative events titled “Finissage of the Stadium X in episodes”.